Moved to a new position under Schalke head coach Domenico Tedesco Max Meyer is finally showing off all his talent for the Gelsenkirchen based club. Earlier this week one of the most significant questions of the transfer window was finally answered. Bayern München announced the signing of a pre-contract with German international midfielder Leon Goretzka. With the midfielder choosing to allow his contract with Schalke to run down there was increased speculation linking him with a move to some clubs, but for Schalke fans, there was a sense of déjà vu as Leon Goretzka followed the path of Manuel Neuer in signing for perennial champions Bayern. In the midst of all the speculation and furore of the Goretzka deal, however, another Schalke player has gone relatively under the radar as his contractual situation mirrors that of Goretzka. 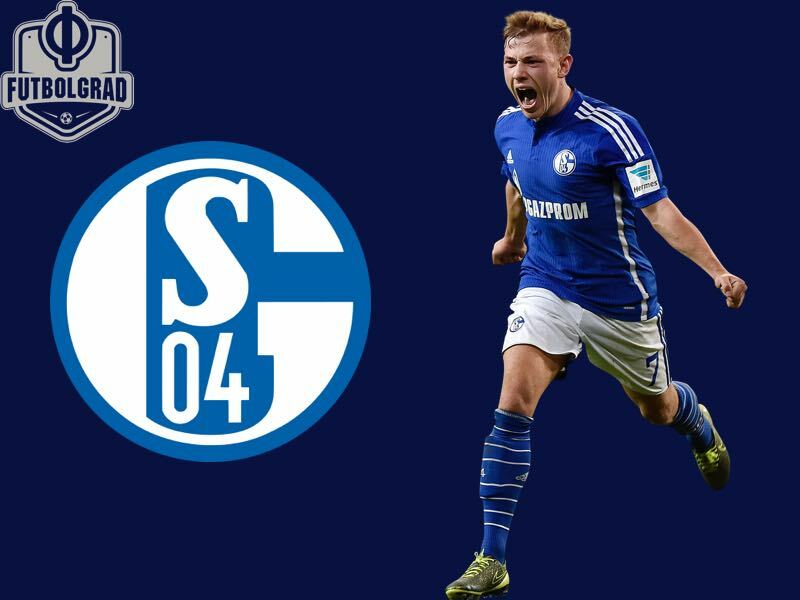 Max Meyer has been with Schalke since 2009 when he moved from MSV Duisburg to join the youth setup in Gelsenkirchen. Since that point, he has been extremely highly rated by those within Schalke and the DFB. Indeed Meyer has been capped at every youth level by Germany culminating in an appearance at the Olympics in 2016; the young midfielder has also been capped at full international level. With that said, however, there has always been a sense around Meyer that his obvious potential does not quite match his performances on the field. Played in his early career as an attacking midfield player capable of playing from wide or central areas with his quick feet and capacity to play in tight areas suggesting that he would one day develop into a top-level attacking player. Still, though this transition from promise to actualised talent never materialised. Indeed when Meyer turned down a contract extension in 2017 Schalke fans seemed to accept the decision, there appeared to be a mutual understanding that to fully develop as a footballer that Meyer would have to do it away from Gelsenkirchen. That was however until the club appointed Domenico Tedesco as coach before this season. The young coach has impressed with his tactical flexibility and ability to form his side into a cohesive defensive shape this season, but arguably the most interesting tactical decision Tedesco has taken been to move Meyer into a deep-lying midfield role. Traditionally players who occupy the space between the defensive and midfield lines are labelled defensive midfielders. In this case, however, Meyer should be very much viewed as a controlling midfielder. His ability in the defensive phase unquestionably still needs work although his positional awareness has developed markedly over the course of this season, most likely due to intensive tactical training from Tedesco. Physically too Meyer is slight and can be found wanting in defensive duels with more physical opponents; this, however, is negated somewhat by the speed and agility that were very much a part of Meyer’s profile as a wide midfielder. While there are some negatives to having Meyer play as a controlling midfielder, these are far outweighed by the positives. As mentioned above Meyer is exceptionally comfortable in taking possession in tight areas, with opponents in the Bundesliga likely to press the player in the defensive midfield strata his agility and ability to manipulate the ball make Meyer extremely press resistant. In moving a player who has primarily been seen as an attacking player back into a deeper role you also have a controlling midfielder whose first instinct when receiving possession is to play the ball forward. Meyer favours short, incisive passing in this role with Whoscored.com having him playing 1130 minutes this season with a pass completion percentage of 89.8%. Meyer rarely surrenders possession and has been one of the keys to the Schalke attacking phase this season, albeit from a much deeper role. Perhaps the most interesting part of playing Meyer from this position lies in his ability to engage and dominate an opponent in one-versus-one situations. Having a player starting from deeper areas but able to drive past opponents with the ball forces the defensive side to make difficult choices to reorganise their defensive block. Meyer can force and exploit central overloads that can be extremely effective in helping his team to break down opponents. This capacity is somewhat rare in a controlling midfielder with only perhaps Mateo Kovacic of Real Madrid having a similar profile. Indeed, with Meyer becoming more and more comfortable in his new role, it will be interesting to see how his skill set develops over the remainder of the season. What next though? Meyer has been clear that he plans to leave Schalke and that he will move away from Germany, is there room however for the club to renegotiate? With the future looking bright under Tedesco perhaps there is scope to convince Meyer to stay at the club and develop fully in his new role? If not, then there will be plenty of suitors from around Europe, where though will his new club choose to use his talents? Back on the wing or controlling the midfield?